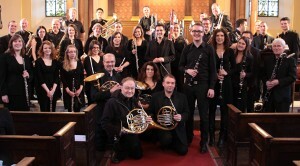 Welcome to the website of the City of London Symphonic Winds, London’s premier Wind Orchestra. The City of London Symphonic Winds, formed in 2006 is a group of woodwind and brass players, based in and around London, performing a range of symphonic music as well as some lighter numbers for wind band. We gave our debut concert in January 2006 at our resident venue, St.Pauls, Covent Garden. Here you will find information on the group, its conductor and Events. Do visit regularly for updates and information. CLSW is run by a committee made up of members of the group. The current committee members are Kara Settle, Roy Young, Ann Bevington, Debbie Fether and Laurence Scott.